Everywhere you turn these days, you will see food trucks on the streets serving up all kinds of delicacies, and you probably have been wondering how to get in on all the action. Well, if you are already a restaurant owner then it is not as difficult as you might think. If you are looking to expand your restaurant, taking it mobile is a smart strategy. By taking your restaurant out on the road, you will be able to serve more customers because you will be going to them instead of waiting for them to enter your restaurant. This way you can reach customers in different locations that are not near your brick and mortar location including cool events going on in your community like street festivals, farmers markets and baseball games. And not only can you reach new customers that you might not have attracted otherwise, you will also be able to serve more food and earn more sales. In addition you are expanding and strengthening your brand as people get used to seeing your logo all over the place. And all this for a smaller upkeep cost than if you expanded to a new physical location. 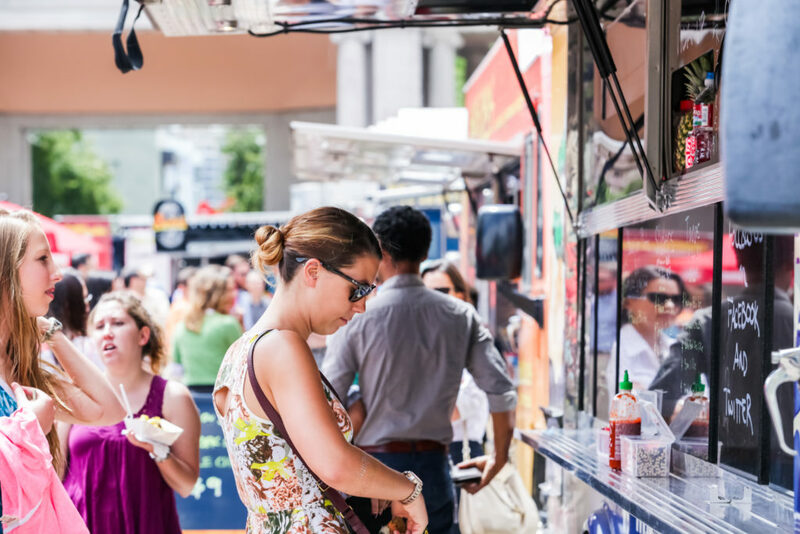 Here are some tips for opening up your food truck. As with any decision about your business, before deciding to expand by going mobile you need to do your research to make sure this is the best move for your particular restaurants. Consider all your startup costs for your food truck. Make sure it will be financially feasible. Some possible costs include permits, licensing and insurance, cost of truck, inventory, commissary fees and upkeep and maintenance of the truck. There are also a lot of options when it comes to the type of food truck you decide to get. You can buy or rent. Buy used or get a custom build-out. It all depends on what makes sense for you financially. Also you need to remember that certain parts of your set up will be vastly different from what it was like establishing your physical location. You will need to set up a commissary because all food trucks are required to have an off-site kitchen where they can prep food, clean all their equipment and store food properly. Also, you will need to get your food safety certifications in order. Your food truck is required to have a food safety certified employee on board at all times so make sure you and all your employees have been certified before you hit the road. To make sure you are filling out all the appropriate paperwork that goes into owning a food truck, find out all the food truck laws in the area you want to operate in and fill out the application with your local health department to get all the necessary licenses and permits. A health inspector will also come out to inspect your food truck and your commissary. As a restaurant owner, you already know all the food safety rules that come with preparing and serving food. Don’t forget that all these rules still apply to your food truck. All the staff on the food truck need to have taken the food safety course and you must have the appropriate certification on display on your food truck for your customers to see. Check with your local department of public health to make sure the rules for preparing food on a food truck don’t differ in any way. As early as possible, make connections with other local food truck owners. They are a good source of support and guidance because they have been where you are now and can offer you good nuggets of advice and help you navigate all the regulations and zoning requirements for operating a food truck in Philadelphia. Look for food truck associations like the Philly Mobile Food Association too. They are another good source of support. Having a mentor can really make a big difference as you are starting out. How much starting a business costs can vary not only by the types of business, but also by where the business will be located. Every city, county, state has its own regulations and the costs of services, rent, supplies etc. can vary as well in different parts of the country. Upkeep and maintenance of the truck which can vary. Use these numbers to help you create a solid business plan that takes into account how much you need to invest initially and how long it will take before you are earning a solid income from your food truck. In big cities like Philadelphia, finding places to park your food truck can be a big challenge. There are different rules for where food trucks are allowed to park and what permits you will need. Check to see if there are any restrictions on parking near restaurants or whether you need to be parked near a bathroom if you are going to be in that spot for a long time. Experienced food truck owners always advice that you schedule locations ahead of time so you know where you are going and when and makes it easier to make sure you have all your permits in order. Local events are also another good place to take your truck, but keep in mind that they have their own set of regulations to follow as well. Taking your restaurant mobile can be a great investment and a lot fun, just make sure you keep these tips in mind when getting started. Contact Zac’s Burgers today.